In our course on Understanding the Exposure Triangle, we talked about the importance of light in photography and about controlling how much light gets exposed to the digital sensor in your camera to produce an image. You learned how ISO, along with the aperture setting and the shutter speed control how much light enters the camera to make you image. These three pillars work together to control lightness or darkness of a photograph. 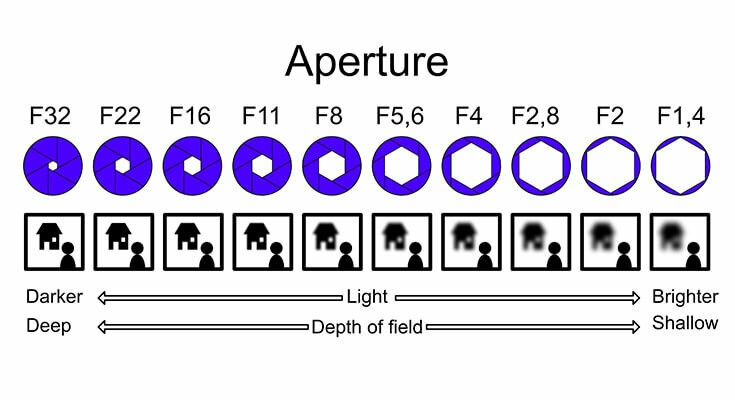 Today we’re going to talk specifically about aperture. Aperture is the opening in the lens through which light passes to the camera and is measured in f-stops (or stops) usually ranging from 1.2 to 32. Inside the camera lens is a mechanical iris diaphragm that controls the amount of light transmitted to the imaging sensor in the camera. The diaphragm stops the passage of light, except for light that passing through the opening (or the aperture). We love this quirky 36 second video from Canon Australia that briefly describes aperture. Aperture plays two important roles in photography. First, it limits the amount of light that passes through the lens so you get a properly exposed image. When you change the f-stop value, you change the opening of the iris. The lower the f-stop, the larger the opening (just the opposite of what you might expect). Second, it controls the depth of field (which is the range in an image that is in focus). Another way to explain Depth of Field is the area of sharpness in front of and behind the subject you’re focused on. Moving from one f-stop to the next (up or down) doubles or cuts in half the amount of light passing through the lens. A smaller f-stop number like 2.8 means a larger opening of the iris. When you change the aperture from a 2.8 to f4, its called stopping down. Lenses have a range of apertures and lenses do not have all apertures available. When we say a lens is a 2.8 lens, that means the lowest aperture available is 2.8. In the diagram above you can see f-stops of; 1.4, 2, 2.8, 4, 5.6, 8, 11, 16, 32. Changing the aperture is usually a setting inside your camera. This entertaining 6 minute video on The Basics of Aperture by Larry Becker at B&H Photo goes into a little more detail on the mechanics of aperture.